Are you looking for a functional tracker focused on the basics? A no-frills but stylish solution is the Fitbit Alta. Available at a fair price point and in colors to suit all design sensibilities, the Fitbit Alta fits men and women looking for a spectacular product. 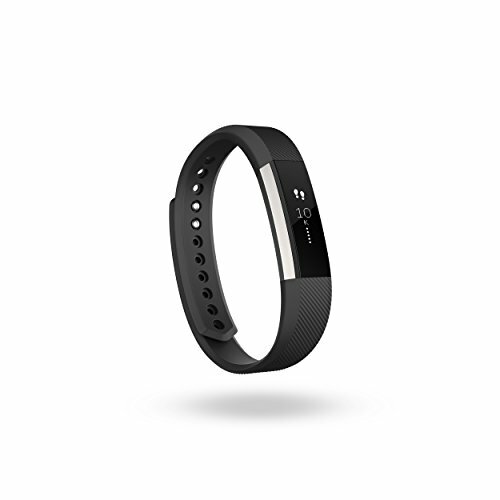 This brand is known for innovation in the world of fitness tracking. Fitbit’s products work for men and women at all fitness levels, whether you are just starting out on your fitness journey or you have a daily workout routine with long-term goals in place. The Alta is all about motivation – no matter who is getting motivated by the product. The Fitbit Alta helps you stay motivated, even during the most hectic of days. Available in sizes for wrists 5.5 inches to 9.3 inches, small, large, and extra-large will suit all people. Connect your phone to your tracker for an expanded experience with your new fitness tracker. An activity tracker is here to provide you with the statistics and information you need for motivation, numbers tracking, and more. The Fitbit Alta allows you to log your fitness numbers without feeling large or cumbersome on your wrist. When making a purchase, you get the product itself, a USB charger, and a Bluetooth device for pairing to your computer (rather than using your phone or tablet). Compared to other options on the market, the Alta looks sleek and keeps your wrist comfortable. It tracks your distance, many steps, active time, and calories burned. There is another option on the market with a heart rate monitor as well (the Fitbit Alta HR). Also, this tracker automatically tracks your sleep as well. If anything, you get so much information you need to decide what to focus on for your personal health goals! Unlike other bands on the market, the Alta has a notification screen. Top brands like Jawbone rely only on the app that goes with the tracker for notifications. Fitbit goes the extra step by not requiring you to take your phone out of your pocket. If you want to see how your day is going, just tap the tracker or log in to the app for a detailed set of numbers. The Fitbit Alta is the perfect solution for everyone from couch potatoes to fitness freaks. The band allows you to set fitness goals and encourages you to reach them with notifications. It has a broad audience because of its wearable size, extensive functionality, and easy to understand app. This provides motivation, whether you are looking to be more active or have a particular goal in mind, like wanting to complete a marathon. One of the reasons people get activity trackers is to know their numbers without feeling like the tracker is obtrusive or bulky. The Fitbit Alta is different than other Fitbit products because of its removable band. A removable band means styling is entirely up to the wearer, whether you stick to a plain, black band or you want to stand out with a rose gold, metal watch band. Fitbit Alta bands, whether made by the company or through a fashion brand, are available to suit every design sensibility. Fitbit is committed to innovative measurements and tracking without making you feel as if you are wearing a bulky device. It suits men and women because of its bracelet-like thickness and weight. Many users still stick with their classic watch and wear the Alta for tracking personal numbers. It doesn’t look large next to your watch and even allows you the change to maintain a professional look. One crucial facet of customization for this product is the interchangeable band. All you need to do is push and slide the quick-release on the band to mix and match. Switch your band for different occasions, including work, working out, and going out. Users asked, and Fitbit answered with their removable accessory bands! When you first log in and set up your Fitbit, it prompts you to set goals concerning your health. At the start, Fitbit helps you establish three goals and helps you track progress through charts and daily statistics. Some example goals would include walking 7,000 steps a day for the first two weeks and move up to 10,000 steps a day after that, drinking eight glasses of water per day, and 30 minutes of high-intensity workouts a day. The Fitbit Alta boasts all-day activity tracking, which means you get their SmartTrack feature available. The device automatically notes if you are moving, and it is better than previous versions at tracking distance, heart rate, and more. The movements tracked by SmartTrack include walking, running, aerobic workout, elliptical, outdoor biking, sports, and swimming. It continually runs calculations for tracking movement which exceeds 15 minutes or more in length. At the end of the workout, it is summarized in your Fitbit app. Instead of just setting goals and forgetting about them, the Fitbit Alta reminds you to get up and move throughout the day. If goals are close, it sends you reminder messages like “Just 250 more steps this hour!” and even buzzes or vibrates depending on the setting you put in place. This tracker does not let you forget about moving throughout the day! Notifications according to preferences. Get notifications from your phone including calling, texting, and calendar notifications. In addition to synced notifications, the Fitbit app lets you know when you are reaching your goals. Announcements are easy to customize according to your preferences. Automatic tracking. The tracker automatically recognizes movement type and tracks activity on the Fitbit application. This includes favorite activities like biking, running, and walking, so monitoring is also accurate to calories burned based on exertion. Extensive battery life. The lengthy battery life of the Fitbit Alta lasts up to five days. You can wear the item without worrying about battery life for nearly the entire work week. Stylish design. In the world of fitness tracking, the Alta has a good-looking design. It is slim and doesn’t outshine a watch you are wearing next to it. With interchangeable bands, it is possible to refine your look even more. They are working to build products that look more like accessories and less like activity trackers. Sleep Tracking Technology. When you wear this device to bed, it also tracks how you sleep. This includes detailed statistics like time in light sleep, deep sleep, REM sleep, and total time asleep. All of this information is delivered via sleep insights on your Fitbit app. Fair price. Adding an activity tracker to your life may actively improve your life. For a reasonable price, it looks great and costs less than other trackers on the market. This option doesn’t have too many bells and whistles – but you don’t need them. Users of the Fitbit Alta love how easy it is to keep track of fitness levels, even if the user isn’t tech savvy for setting up and maintaining the device. Customers report, “I’m not ‘techy, ’ but I love that it’s SO easy to set up.” The SmartTrack technology that comes with this band is trademarked because of its ability to automatically track your movement and even classify it based on your level of activity. You don’t have to be tech-savvy to understand the Fitbit Alta or understand your stats. As a result of its size, the Fitbit Alta does not have a significant screen; it is 128-by-36 pixels on its 1.4-inch screen. For some users, this is a negative because they want a larger screen which is simple to read. It isn’t always user-friendly for people with sight issues or those looking for a bright, vivid display. You should not purchase this item for color, a high pixel count, or amazing graphics. The initial purpose of this piece is as a fitness tracker. Haven’t made an activity tracker purchase yet? The Fitbit Alta is the right solution for any user ready to commit to fitness tracking. This isn’t just a starter product, and it is one that grows with your needs and adapts to your changing requirements. On top of this, it is easy to style according to your personal preferences. You’ll love this lightweight product for the benefits it provides to you on a daily basis. Whether you are a daily running with a large wrist or a business professional looking to increase your daily steps, the Alta from Fitbit boosts your motivation. Its slim design doesn’t get in your way, and other users report it does not irritate the wrist. Go about your regular life, but maintain a clear picture of your health with a fitness tracker on your side. With the Fitbit Alta, you’ll achieve your fitness goals and get accurate statistics for daily efforts.